The Jio juggernaut continues to roll on, with the new entrant reporting the highest addition in active subscribers for the fourth consecutive month. Reliance Jio Infocomm Ltd added 8.5 million active subscribers in October, much better than Bharti Airtel Ltd’s tally of 3.4 million, shows data compiled by Motilal Oswal Securities Ltd. Vodafone Idea Ltd’s active user base eroded by 2.9 million. Its shares unsurprisingly fell 2%. Interestingly, Reliance Jio’s parent, Reliance Industries Ltd’s (RIL’s) shares also fell 1.5% despite the gains in subscriber base. It may be gaining ground, but its focus on subscriber additions and cost-effective feature phones are limiting earnings expectations. “We note that the chase for feature phone subscriber market share has led to the roll out of low-average revenue per user plans," Motilal Oswal said in a note, referring to the Jio Phone offering. In any case, investors are already pricing in a far higher market share for Reliance Jio in RIL’s current valuations. The monthly subscriber addition numbers can do little to increase bullishness on the stock. Besides, the subdued trend in subscriber additions at incumbents does not necessarily mean commensurate revenue market share gains. After all, Airtel and Vodafone Idea have been looking to weed out low-value subscribers. They introduced minimum recharge plans, requiring subscribers to mandatorily recharge to stay active on the network. In fact, this may lead to further subscriber share losses, as the full impact of the tariff hike is yet to be seen. 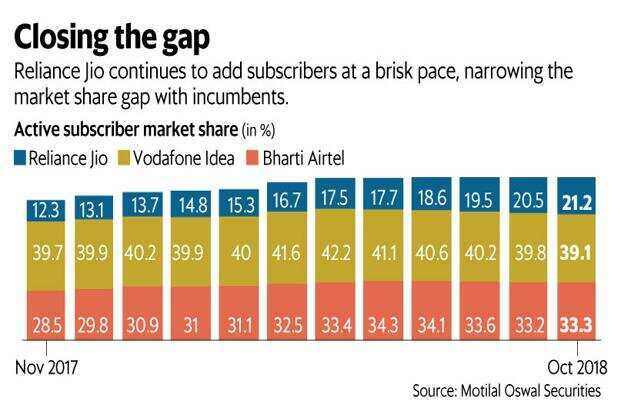 According to Motilal Oswal, around one-third of (35%) of Airtel and Vodafone Idea subscribers are low-paying customers (sub-₹15). As the tariff hikes kick in, the broking firm sees significant churn in this part of the user base. “A drop in the number of subscribers, per se, isn’t something that will worry incumbents," says an analyst at a domestic institutional brokerage firm. Of course, it’s another matter if Reliance Jio starts weaning away high-value subscribers as well. Revenue market share numbers till the September quarter show that the new entrant has been more successful in markets outside the metros, indicating that incumbents have done reasonably well in holding on to high-value subscribers. Much also depends on how dual-SIM users react to the tariff hikes. If a large section of customers prefers to retain Reliance Jio as their primary telecom connection, then it can make a notable dent to incumbents’ revenue base, say analysts.